Born and raised in Knockaderry, Co. Limerick, Michael is the eldest of five children. He had to help support his family from an early age, inspiring him to push further and achieve his dreams. “No” was never an option for Michael, as he makes clear: “if you tell me I can’t do something, that’s when I become determined to get it done.” He was the first person in his family to attend college, graduating University College Cork while working odd jobs to pay for tuition. After graduation he went to New York and earned a master’s degree from Fordham. Michael and his wife, Kathy, live on Long Island with their two children, Brian and Elizabeth. 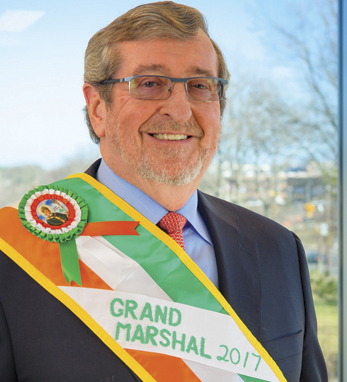 Dowling was named the 2017 New York City St. Patrick’s Day Parade Grand Marshal. Click here to read Dowling’s April / May 2017 Hall of Fame profile.